Tips on Running in COLD Weather! Home › BLOG › Tips on Running in COLD Weather! It's been so very cold this week, we figured we'd give some quick tips on running in the cold. Remember it's all about the BASE layer! Quality counts as well as seaming and construction. Check out CRAFT, Brooks and Mizuno to keep you warm and comfortable! Best Dressed. Always dress like the temperature is 10 to 15 degrees warmer than it actually is, and plan on being chilly for the first five to ten minutes. This way you won't overheat once you warm up. Be strategic about your layers. Use a base layer, mid layer, and a shell to stay warm without bulk. Be Smart. 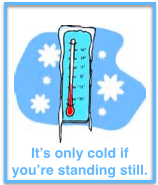 If the real feel is colder than -10 degrees Fahrenheit consider shortening your run to no more than 30 minutes.